Our ranking of the 50 Safest Emerging Markets Banks reflects their vulnerability to shifts in the global financial markets, rising global trade tensions and geopolitical instability. These factors are contributing to interest rate and currency volatility, while concerns of slowing economic growth threaten to negatively impact business confidence and capital spending. 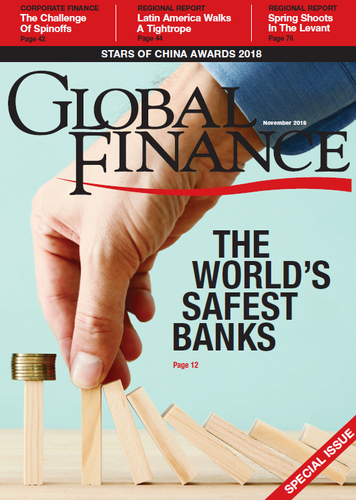 With this uncertainty, our 2018 rankings provide a valuable guide for banks in the emerging markets, and are determined based on the eligibility criteria in our methodology: Entities must have at least two ratings from the three global ratings agencies and also be among the world’s largest 500 banks by assets. Many emerging markets economies are sensitive to US dollar appreciation and struggle with currency stability. Specifically, the strengthening US dollar over the course of the year is an area of concern, given emerging markets bank holdings of outstanding US dollar-denominated sovereign debt and corporate loans. Further appreciation, and associated credit-spread widening, could be problematic and contribute to credit-risk concerns and the deterioration in bank asset quality. Emerging markets banks must contend with the outlook for slowing global economic growth amid the threat of disruption in global trade as tension between the US and China escalates. Also contributing to a challenging outlook are the rise in oil prices due to US sanctions on Iran and the economic crisis in Venezuela, combined with supply-output pressures and a general lack of capacity. Contagion from economic and currency crises in a number of countries, including Argentina and Turkey, also contributes to considerable market volatility that impacts the credit and foreign-exchange exposures for emerging markets banks—as well as banks in developed markets that conduct cross-border business or have subsidiaries in these or other emerging markets countries. Given this backdrop, there are shifts in the composition of our 2018 rankings resulting from ratings downgrades in a number of countries, including China, Chile and Qatar. While the top five positions remain unchanged compared to 2017, the three Chinese policy banks—China Development Bank, Agricultural Development Bank of China and the Export-Import Bank of China—each fell one place following a one-notch downgrade by S&P. Agricultural Bank of China rose to 20th following a Moody’s upgrade. Chile is the lone Latin American representative in our rankings, and a Moody’s downgrade of the sovereign rating was the catalyst for a downgrade of Banco del Estado de Chile (14th), Banco Santander Chile (24th) and Banco de Chile (25th), reflecting diminished expectations for government support. This rating dynamic also hammered Qatar, with most Qatari banks downgraded by Fitch following a sovereign downgrade. South Korea is strongly represented in our rankings, taking the top three spots. Woori Bank benefited from a Moody’s upgrade to rise to 31st and is one of nine South Korean banks in the Emerging Markets Top 50. Notable newcomers to our 2018 rankings include three Saudi Arabian banks: Al Rajhi Bank, Samba Bank and Banque Saudi Fransi. Overall, our rankings include 23 banks from the Gulf Cooperation Council states.